A brilliant, moving meditation on craft and love, and an intimate portrait of baking and our communion with food—complete with seventy-five original recipes and illustrated with dozens of photographs and original hand-drawn illustrations—from the head bread baker of King Arthur Flour. Yearning for creative connection, Martin Philip traded his finance career in New York City for an entry-level baker position at King Arthur Flour in rural Vermont. A true Renaissance man, the opera singer, banjo player, and passionate amateur baker worked his way up, eventually becoming head bread baker. But Philip is not just a talented craftsman; he is a bread shaman. Being a baker isn’t just mastering the chemistry of flour, salt, water, and yeast; it is being an alchemist—perfecting the transformation of simple ingredients into an elegant expression of the soul. 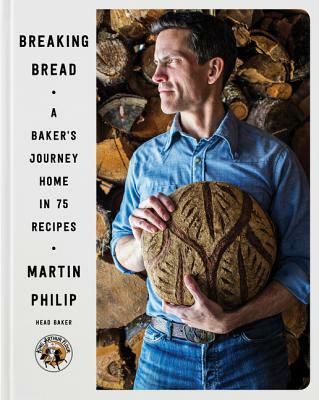 Breaking Bread is an intimate tour of Philip’s kitchen, mind, and heart. Through seventy-five original recipes and life stories told with incandescent prose, he shares not only the secrets to creating loaves of unparalleled beauty and flavor but the secrets to a good life. From the butter biscuits, pecan pie, and whiskey bread pudding of his childhood in the Ozarks to French baguettes and focaccias, bagels and muffins, cinnamon buns and ginger scones, Breaking Bread is a guide to wholeheartedly embracing the staff of life. Philip gently guides novice bakers and offers recipes and techniques for the most advanced levels. He also includes a substantial technical section covering the bread-making process, tools, and ingredients. As he illuminates an artisan’s odyssey and a life lived passionately, he reveals how the act of baking offers spiritual connection to our pasts, our families, our culture and communities, and, ultimately, ourselves. Exquisite, sensuous, and delectable, Breaking Bread inspires us to take risks, make bolder choices, live more fully, and bake bread and break it with those we love.